Literal is a source code representation of a value, i.e. it is a value that has been hard-coded directly into your source. x is a variable, and 100 is a literal. There are two Boolean literal values: true and false. Integer literals are used to write values of types int, uint, long, and ulong. Integer literals have two possible forms: decimal and hexadecimal. Real literals are used to write values of types float, double, and decimal. A character literal represents a single character, and usually consists of a character in quotes, as in 'a'. C# supports two forms of string literals: regular string literals and verbatim string literals . 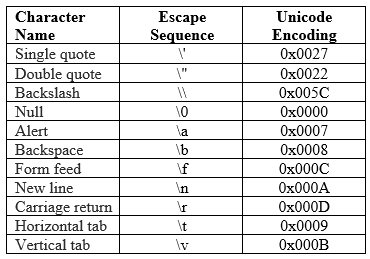 A regular string literal consists of zero or more characters enclosed in double quotes, as in "string", and may include both simple escape sequences (such as \t for the tab character) and hexadecimal and Unicode escape sequences. A verbatim string literal consists of an @ character followed by a double-quote character, zero or more characters, and a closing double-quote character. They can store characters or escape sequences. A simple example is @"string". Null Literal is literal that denotes null type. Moreover, null can fit to any reference-type . and hence is a very good example for polymorphism. Constants are values which are fixed and cannot be changed anytime during program execution. They can be of any data type.